The Best Toilet Paper for Sensitive Skin - Reviews and Comparisons! / Picking the Best Toilet Paper for Sensitive Skin – Reviews and Comparisons! Picking the Best Toilet Paper for Sensitive Skin – Reviews and Comparisons! Last Updated March 24th 2019: The impact that rough toilet paper can have on your skin and intimate areas is often overlooked when we do our weekly shop. However with so much variety on the market we can end up making the wrong choice. Thankfully in this guide we will help you pick the best toilet paper for sensitive skin and provide you with in-depth reviews of each brand. Using cheaper or less reliable brands can often lead to irritation and damaging the skin. This is unpleasant and very uncomfortable, especially in younger children who have more sensitive skin. That being said, if you are looking for something to make your bathroom experience a little easier for everyone, take a look at our bathroom air fresheners. Allergies to specific ingredients and sensitive skin mean that you need a more specialist toilet paper. If not then the end result is dryness, soreness, red skin or rashes. Studies have even shown that some toilet paper is so rough is can cause micro cuts on the skin, which are painful and uncomfortable. Thankfully the answer is out there, with companies making ranges of sensitive toilet paper to deal with the issue. There are a few on the market so we’ve identified our top three for you to choose from. Charmin are perhaps the most recognisable name in the toilet paper industry with a presence in most countries. They’ve been operating since 1920, beginning with just a single product. Nowadays they have a wide product range, including sensitive ranges. Charmin as a company are committed to making the bathroom experience more pleasant. They have created award winning products and made themselves pretty much the most popular choice for toilet paper. Charmin’s Ultra Gentle toilet paper has been developed to replace their sensitive toilet paper. It’s been specifically created for those with sensitive skin to give a smooth and easy wipe every time. Created specially to help those with sensitive skin the toilet paper has soothing lotion on every single sheet. This is what makes it so effective. 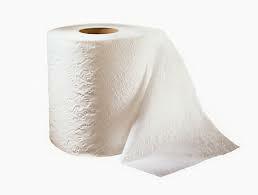 It’s made in 2 ply to be thicker and softer, making wiping easier and the roll longer lasting. The Charmin Ultra Gentle Toilet Paper has been dermatologically tested to give the best possible results. This means you can have confidence that even with sensitive skin you won’t have an unpleasant experience. Finally the Charmin Ultra Gentle Toilet Paper has been tested by plumbers. The toilet roll is clog free and won’t block your toilet, despite being thicker and softer than alternative brands. “This may sound crazy, but this is my favorite tp! It is very soft but strong enough to get the job done, and it's also safe for septic systems.” - Ted E.
People admire the durability of the toilet roll and how it improves the experience for those with sensitive skin. The only real criticism of the Charmin Ultra Gentle Toilet Paper seems to be that it’s hard to find in a lot of countries. Your best bet is to look online, sites like amazon normally carry a healthy stock. It is one of the most expensive brands around, but if you suffer with sensitive skin you’ll appreciate the relief is worth the extra cost. Charmin are the biggest name in the toilet paper world and know how to make a really useful product. 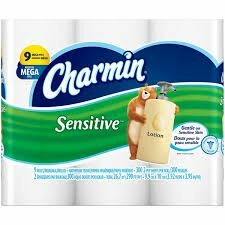 Charmin’s Ultra Gentle toilet paper has been created with those who suffer from sensitive skin in mind. It’s been developed to replace the burning sensation with a cooling and soothing experience. If you have sensitive skin then you should go and buy some today and let the healing begin. Get the Lowest Price on Amazon! Alongside the Ultra Gentle range, Charmin have developed their Ultra Soft Toilet Paper. 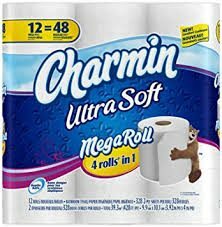 It’s unsurprising that Charmin have 2 of our top 3 spots, simply because they are one of the leading toilet paper manufacturers for sensitive skin. Charmin Ultra Soft toilet paper is made with 2 ply to make it more durable. This means you’ll use less than other brands and the rolls will last longer. Available scented or unscented depending on preference and is soft to the touch. This means no sore skin or irritation. The Charmin Ultra Soft toilet paper has won a seal of approval from Good Housekeeping and is one of the most popular toilet papers on the market. Charmin Ultra Soft toilet roll has been dermatologically tested to make sure it’s gentle on your skin. It’s also been tested by plumbers to make sure it won’t clog your toilet. Charmin products have also been proven to last up to 4x longer than alternative products. “These are ultra soft and double rolls and best of all they overall work better than any other that we have used: EVER. Some TP is too rough; not theirs. Some TP falls apart before finishing its purpose; not theirs. Some TP is so thick it will not flush; not theirs” - Mandy P.
Some customers have complained that while the toilet paper is as soft as they expected, it isn’t as thick as some other brands. It’s always worth shopping around, but Charmin do know their stuff when it comes to toilet paper, so don’t be surprised if you end up back where you started. 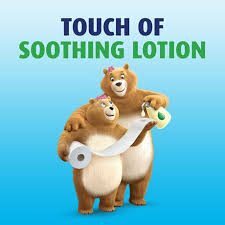 While being a similar product, the ultra soft toilet paper doesn’t feature the soothing lotion. This can mean less soothing relief, but some users can be allergic to the ingredients so it’s a better option. The main advantage of the Charmin Ultra Soft Toilet Paper is that it’s more affordable and available pretty much everywhere. Charmin know how to make a great toilet paper that can deal with sensitive skin, so don’t settle for less and upgrade your toilet roll today. Get the Cheapest Price on Amazon! 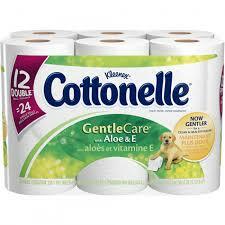 Cottonelle are the American brand, producing toilet paper that is sold worldwide. They believe in making your bathroom experience as comfortable as possible with a range of products designed for different requirements and budgets. Cottonelle have a full line of products which are all septic safe and more durable than a lot of their competition. They look to add value to the customer with products that last longer and give more comfort. Cottonelle Gentle Care toilet paper is made with a clean ripple texture. This is soft but designed to give a thorough clean from even a single wipe. 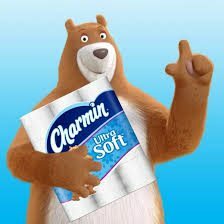 The toilet paper is 1ply rather than 2ply so it’s less thick than the Charmin toilet paper. 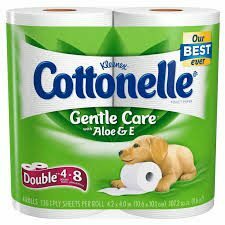 Each sheet of Cottonelle Gentle Care toilet paper contains Aloe and Vitamin E. These are known for their soothing properties and are gentle on sensitive skin. The toilet paper has been dermatologically tested for use on sensitive skin. “I found this, and thought I would give the Aloe a try. It changed my life. I no longer have to deal with the times when I get sensational burning, if I do, I know I can just wipe to bring soothing alleviation” - Denny D.
“ From my experience, This stuff tears real easily. I do not like paper that your tears or your fingers go through as soon as you start to use it. The aloe on this paper just makes it more easily torn.” - Scott F.
Cottonelle have opted for a 1ply toilet paper instead of 2ply, meaning it is thinner than the alternatives. This does mean that it can tear more easily. On the flip side it makes it very gentle and the soothing aloe does a great job of helping those with sensitive skin. This just means you may have to be slightly careful when using the product, but it doesn’t seem like it’s an issue for many users. Cottonelle Gentle Care toilet roll is one of the most popular toilet papers around because of it’s soothing ingredients and soft touch. It’s long lasting which means more value for the customer and their double roll is perfect for those with families who don’t want to have to replace it so regularly. An affordable and effective product, it’s a great choice for those with sensitive skin. All three of these names are well known by most households around the world. They’ve taken the time to create unique products to help those with sensitive skin, and have made some very useful and soothing toilet paper. Thankfully with these soft toilet paper choices you don't have to worry as much about clogs. But if you have been experiencing toilet clogs then you should check out our toilet auger reviews page. Each of them have made the list because of their soft, durable and long lasting nature. They’re all great choices for those with sensitive skin and available in most places plus through online stores like Amazon. They are all similar, with just a few distinct differences, so your choice will depend on your preferences when it comes to scent and lotion. Overall It seems like Charmin are making the best toilet paper for those with sensitive skin, and it’s clearly the most popular choice at the moment. Check out their range today and make the switch to gentle toilet paper if you or your family suffer from sensitive skin.